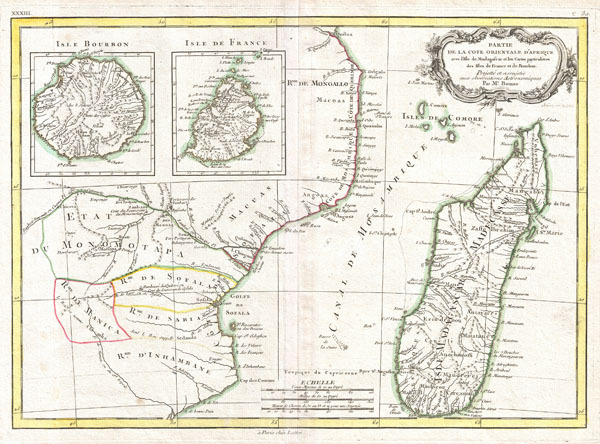 Partie de la Cote Orientale D'Afrique avec L'Isle de Madagascar et les Cartes particulieres des Isles de France et de Bourbon. A beautiful example of Rigobert Bonne's c. 1770 decorative map of southeastern Africa and Madagascar. Roughly covers the territory current incorporated into Mozambique and Madagascar. Also includes inset map of the Isle Bourbon and Isle de France or Mauritius. This region of Africa held a particular fascination for Europeans since the Portuguese first encountered it in the 16th century. At the time, this area was a vast empire called Mutapa or Monomotapa that maintained an active trading network with faraway partners in India and Asia. As the Portuguese presence in the area increased in the 17th century, the Europeans began to note that Monomatapa was particularly rich in gold. They were also impressed with the numerous well crafted stone structures, including the mysterious nearby ruins of Great Zimbabwe. This combination led many Europeans to believe that King Solomon's mines must be hidden in this region. Sure enough our map shows the 'Mts. Fuca riches en Or' in the western parts of Monomotapa. Monomotapa did in fact have rich gold mines in the 16th and 17th centuries, but most have these had been exhausted by the 1700s. A decorative title cartouche appears in the upper right hand quadrant. Drawn by R. Bonne in 1770 for issue as plate no. C. 30 in Jean Lattre's 1776 issue of the Atlas Moderne. Rumsey 2612.068. National Library of Australia, MAP RM 3126. Phillips (Atlases) 664. National Maritime Museum, 215.